After receiving invites from Acer Malaysia and Yes 4G/Google/Samsung, here comes yet another press event on this coming Wednesday that you might want to take note. Hailing from LG Malaysia and Brightstar, we are starting to think if there’s something special about 22 May for local tech industry that we are not aware of. Judging from the press invite, we might be looking at the launch event for LG Optimus G (E975), LG Optimus L9 (P768e) and the dual-SIM version of LG Optimus L5 II (E455). This is further strengthen by the appearance of all three devices as the most recent additions to the company’s listing on SIRIM’s database. The latest entries on SIRIM’s database for Brightstar. Out of these three device, only LG Optimus L5 II can be considered as a recent device since it was announced during MWC 2013. Both LG Optimus L9 and Optimus G [here’s our review of the device] were launched back in 2012 which made us wonder what took LG so long to bring them to Malaysia with the risk of these devices being deemed as outdated by consumers even though they might have possessed capable hardware and features in their own rights. On another hand, will we be able to see more up-to-date LG smartphones such as LG Optimus G Pro or the rumoured Optimus G2 at the event? 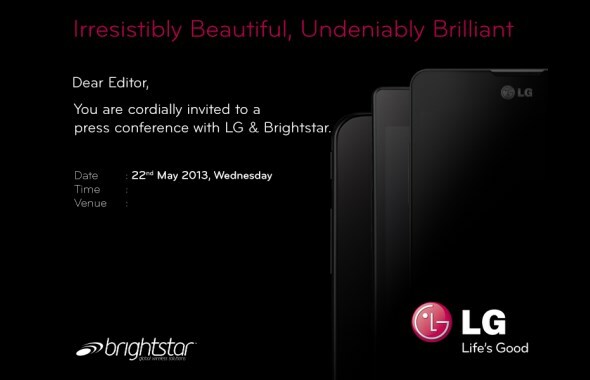 Regardless of that, we are still going to be there to see what LG and Brighstar have to announce this coming Wednesday. So, stay tuned.